Made in Germany by Rohloff. 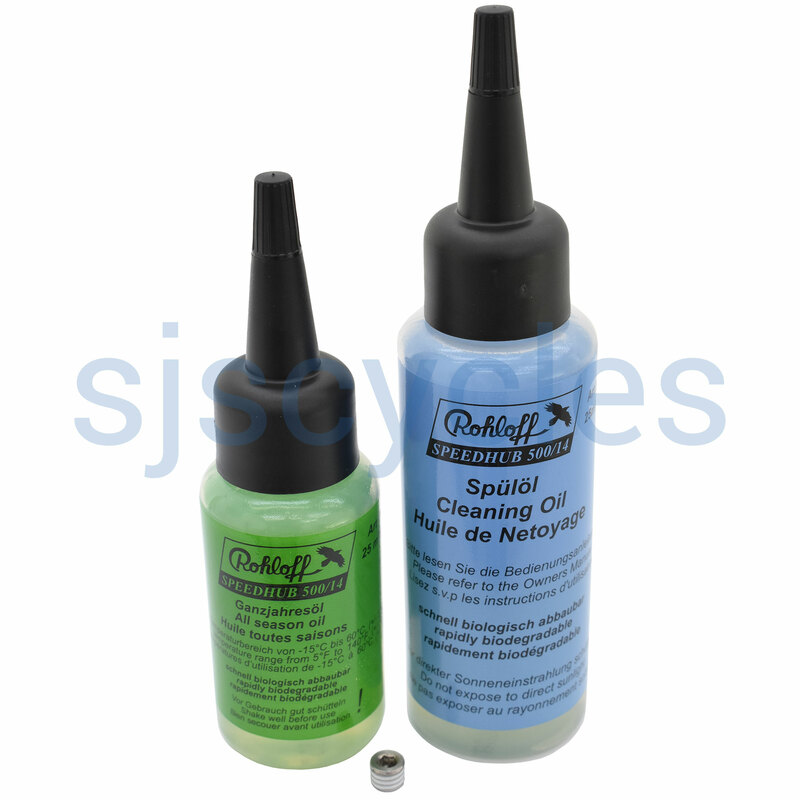 This 2 stage kit comes complete with the cleaning oil which you use prior to performing the oil change (it thins the oil in the hub and facilitates its removal.) It also comes with the actual All season oil needed to refill the hub. People complaining about the price of this are missing the point. The main costs are in packaging and delivering the product, I don't suppose the oil is a big deal. If you don't like the cost Rohloff do a pack with much larger amounts of the two oils and it will be cheaper of you use it for several years. As others have already said, ludicrously overpriced, but necessary if you don’t wish to invalidate your warranty on a costly repair/replacement. ConsRivals Channel No 5 in cost to the user. Less fragrant. ProsOily and smells of gear oil - some sulphur compound I think. Annual rip-off for a sqirt of oil. Invalidate warranty or pay up! I'm not suggesting SJS are the rip off artists necessarily, it's a Rolloff thing I'm sure. How about including a handy grub screw coated in thread sealant? ConsYou would be foolish to use anything else in view of the implications for the guarantee. Having just done our annual oil change the gears are running noticeably smoother, even though we had only done 3500km this year on our tandem. Moral: even if you haven't done 6000km during the year it is still worth doing the oil change. It is now possible to buy this oil from SJS in larger bottles which seems better value, as long as you haven't discarded the small bottles which are handy for measuring out the correct dose before you start each oil change.. I bought this because my speedhub was due for an oil change and using anything but the Rohloff oil invalidates the warranty. The oil is conveniently packaged but costs an absolute fortune when you consider the volumes involved! The oil arrived very quickly after the order was placed. I couldn't extract enough to fill up to the 25ml mark on my pipette: 2 to 3mls more would be better. Convenient bottles of oil and flushing thinner, arrived next day by post but what a price for such a small amount of oil! I have now done four oil changes so have four sets of plastic bottles. How about doing a refil service at a discount price? Consnot good for first oil change unless you have good kit. I bought this kit because I already have the more comprehensive kit that comes supplied with syringe, sealing plug and allen key. If you haven't changed the oil in your speedhub yet - don't buy this, buy the part number (SJS) 12171, it will be so much easier. Apart from that - this oil seems to do the job, and my speedhub still goes strong approaching 5th oil change. No this is not suitable for any other hub that the Rohloff hub.